Holzwarth, Hans Werner. Koons. Cologne: Taschen, 2015, p. 57. Michael, Androula. “Face à Face: Koons/Picasso.” Dossier de L’Art October 2015, pp. 66-67 (installation view, Guggenheim Museum Bilbao, Bilbao). Rothkopf, Scott [supervised by Bernard Blistène]. Jeff Koons: La Retrospective. France: Centre Pompidou, 2014, p. 48 (installation view, Rockefeller Center, New York, 2000). Koons, Jeff and Norman Rosenthal. Jeff Koons: Entretiens avec Norman Rosenthal. Hove, England: Thames & Hudson, 2014, pp. 48-9 (installation view, Documenta IX, Hess, Germany, 1992) [French Edition]. Koons, Jeff and Norman Rosenthal. Jeff Koons: Conversations with Norman Rosenthal. China: Thames & Hudson, 2014, pp. 48-9 (installation view, Documenta IX, Hess, Germany, 1992) [English Edition]. Gagosian Gallery. Jeff Koons: Split-Rocker. England: Gagosian Gallery, 2014. Gagosian Gallery. Jeff Koons: New Paintings & Sculpture. Exh. cat., Uckfield, England: Gagosian, 2014, p. 10 (installation view, Schloss Arolsen, Hess, Germany, 1992). Mazoyer, Elisabeth, Jean-Patrick Mazoyer, and Reynald Montaigu. Así somos! Espagnol. Belin Education, 2014, pp. 128-129. Polsinelli, Michael and Sasha Burkhanova. “The Words.” Garage Magazine Fall/Winter 2014, p. 95 (installation view, Rockefeller Center, New York, 2000). Sterckx, Pierre. “Quand Jeff Koons euphorise l’art.” Beaux Arts editions December 2014, p. 46 (installation view, Documenta IX, Hess, Germany, 1992). "Welcome to the Funhouse." The American Visual Arts in China Summer/Fall 2012, p. 41. Obrist, Hans Ulrich. The Conversation Series 22 : Jeff Koons. Cologne: Verlag der Buchhandlung Walther König, 2012, p. 15 (installation view, Schloss Arolsen, Hess, Germany, 1992). Tölke, Andreas. “Gleichgewicht Der Kräfte.” Build March 2011, p. 49, illustrated in color. “Mr. Koons what’s interesting about Manet?” Brutus [Japan] 15 June 2010, illustrated in color, p. 16 (installation view, Guggenheim Museum Bilbao, Bilbao). Barrett, Terry. Making Art Form and Meaning. New York, 2010, p. 208, illustrated in color. The Brant Foundation. Remembering Henry’s Show. Greenwich: The Brant Foundation, 2010, pp. 3, 175, 228, and cover, illustrated in color. Castro, Jan Garden. "American Art Now...Twelve Innovative Artists (Jeff Koons)." A+L Art and Living Now 2010, p. 31, illustrated in color (installation view, Guggenheim Museum Bilbao, Bilbao). Naumann, Francis M. Jeff Koons - New Paintings. New York: Gagosian Gallery; Base Design, 2010, p. 5, illustrated in color (installation view, Rockefeller Center, New York, 2000). Richter, Peter. "I ♥ Jeff Koons." BMW Magazine Autumn 2010, p. 54, illustrated in color (installation view, Rockefeller Center, New York, 2000). Segalot, Philippe, Franck Giraud and Joachim Pissarro. The Impossible Collection: The 100 Most Coveted Artworks of the Modern Era. New York: Assouline, 2009, fig. 92, illustrated in color (installation view, Schloss Arolsen, Hess, Germany, 1992). Guggenheim Museum Bilbao. Guggenheim Museum Bilbao Collection. Bilbao, 2009, p. 226, illustrated in color (installation view, Guggenheim Museum Bilbao, Bilbao). Forbat, Sophie, ed. 40 Years Kaldor Public Art Projects. Sydney, 2009, pp. 4, 20, 164-173, illustrated in color. Teeman, Tim. "The Conversation: Jeff Koons." The London Times 13 June 2009, p. 3, illustrated in color (installation view, Guggenheim Museum Bilbao, Bilbao). POP Life: Art in a Material World. Exh. cat., London: Tate Modern; Hamburg: Hamburger Kunssthalle; Ottawa: The National Gallery of Canada, 2010, p. 25 (installation view, Schloss Arolsen, Hess, Germany, 1992). Sollins, Marybeth, ed. Art:21 – Art in the Twenty-First Century 5. New York: Art 21, Inc., 2009, p. 92, illustrated in color (installation view, Schloss Arolsen, Hess, Germany, 1992). Jeff Koons: Popeye Series. Exh. cat., London: Serpentine Gallery, 2009, p. 50, illustrated in color (installation view, Rockefeller Center, New York, 2000). Carroll, Colleen. How Artists See Jr.: Dogs. New York, 2008, p. 5, illustrated in color (installation view, Rockefeller Center, New York, 2000). Holzwarth, Hans Werner, ed. Jeff Koons. Cologne, 2008, pp. 48, 383-385 (installation view, Rockefeller Center, New York, 2000), 386-89 (installation view, Schloss Arolsen, Hess, Germany, 1992), 391 (installation view, Guggenheim Museum Bilbao, Bilbao), 394 (installation view, Museum of Contemporary Art, Sydney, 1995), illustrated in color. Simmons, Matthew. "Art Star." Lifestyles Magazine Winter 2008, p. 30, illustrated in color (installation view, Schloss Arolsen, Hess, Germany, 1992). Thon, Ute. "Spieglein, Spieglein an der Wand." Art October 2008, p. 43, illustrated in color (installation view, Guggenheim Museum Bilbao, Bilbao). Seymour, Stephanie. “Jeff Koons: Art Made in Heaven.” Whitewall Fall 2007, p. 140, illustrated in color (installation view, Brant Foundation, Greenwich, Connecticut). Canarutto, Sarah Cosulich. Jeff Koons (Supercontemporanea series). Milan, 2006, pp. 64-65, illustrated in color (installation view, Schloss Arolsen, Hess, Germany, 1992). Zappi, Lucrécia. “O Rei do Neopop; o controvertido artista Americano Jeff Koons rejeita rótulo de kitsch.” Illustrated [Brazil] 26 July 2006, illustrated in color on the cover. Griffin, Tim. “Method Acting: The Artist-Interviewer Conversation.” Art Journal (vol. 64, no. 3) Fall 2005, p. 71, illustrated in color (installation view, Rockefeller Center, New York, 2000). Lacayo, Richard. “How Does ‘80s Art Look Now.” Time 28 March 2005, pp. 59-60. McNatt, Glenn. "Pop with No Apologies." The Baltimore Sun 9 April 2005. Miller, Ken. “The Establishment: Jeff Koons.” Tokion March/April 2005, pp. 6, 16, 38-41, illustrated. Politi, Giancarlo. "Jeff Koons: an Interview by the Readers of Flash Art." Flash Art (no. 240) January-February 2005, p. 86, illustrated in color (installation view, Schloss Arolsen, Hess, Germany, 1992). Saltz, Jerry. "The Emperor’s New Paintings." Village Voice 29 March 2005. Smith, Edward. “Krens on the 20th Century.” Hermitage (no. 5) Summer 2005, p. 59, illustrated in color (installation view, Schloss Arolsen, Hess, Germany, 1992). Tel Aviv Museum of Art. Nir Hod: Forever in Israel. Exh. 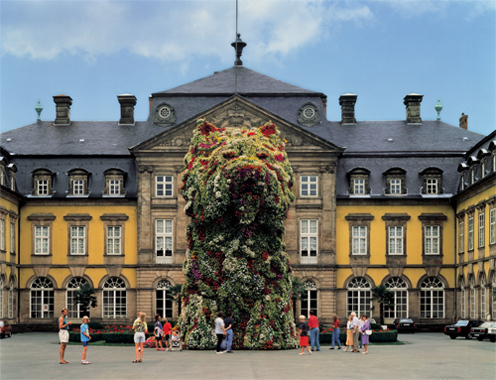 cat., 2005, p. 34, illustrated in color (installation view, Schloss Arolsen, Hess, Germany, 1992). The Editors of Phaidon Press. The Art Book for Children. New York, 2005, p. 64, illustrated in color. Thomas, Kelly Devine. “The Selling of Jeff Koons.” Art News 104 (no. 5) May 2005, p. 120, illustrated in color (installation view, Guggenheim Museum Bilbao, Bilbao). Woltmann, Marit, ed. Jeff Koons Retrospektiv. Exh. cat., Oslo: Astrup Fearnley Museet for Moderne Kunst, 2004, pp. 76-77. Wehr, Anne. Plop: Recent Projects of the Public Art Fund. New York: Merrel, 2004, pp. 130, 131, illustrated in color (installation view, Rockefeller Center, New York, 2000). Jeff Koons: Highlights of 25 Years. Exh. cat., New York: C&M Arts, 2004, p. 9, illustrated in color (installation view, Schloss Arolsen, Hess, Germany, 1992). Jeff Koons. Exh. cat, Naples: Museo Archeologico Nazionale, 2003, pp. 156-57, illustrated in color (installation view, Schloss Arolsen, Hess, Germany, 1992). Jeff Koons / Andy Warhol: Flowers. Exh. cat., New York: Gagosian Gallery, 2002, pp. 41-43, 51-53, illustrated in color (installation views, Schloss Arolsen, Hess, Germany, 1992; Guggenheim Museum Bilbao, Bilbao; Museum of Contemporary Art, Sydney, 1995; Rockefeller Center, New York, 2000; Brant Foundation, Greenwich, Connecticut). 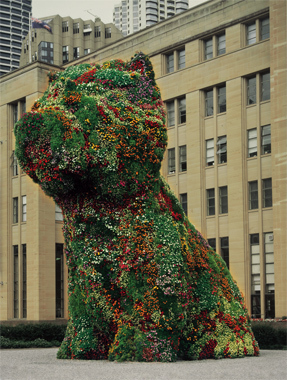 Jeff Koons: Pictures 1980 - 2002. Exh. 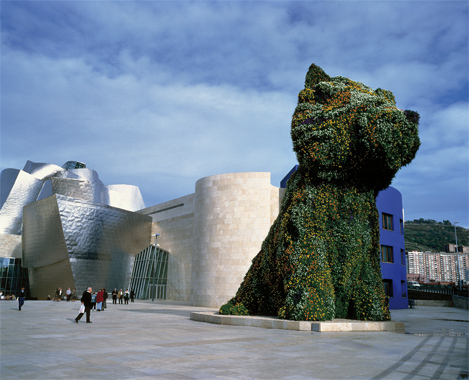 cat., Kunsthaus Bielefeld, 2002, p. 27, illustrated in color (installation view, Guggenheim Museum Bilbao, Bilbao). Jeff Koons: Easyfun-Ethereal. Exh. cat., Berlin: Deutsche Guggenheim, 2001, p. 20 (fig. 4), illustrated in color (installation view, Schloss Arolsen, Hess, Germany, 1992). Artforum October 1997, p. 65 (illustrated advert). Loers, Veit. "Puppy, the Sacred Heart of Jesus." Parkett December 1997 (no. 50/51), p. 81, illustrated in color (installation view, Schloss Arolsen, Hess, Germany, 1992). Bomb Summer 1996, p. 55, illustrated. Krum, Sharon. "The Man Who Makes Giant Puppies." The Australian Way January 1996, pp. 42-44, 43, illustrated. Weintraub, Linda, Arthur Danto and Thomas McEvilley. Art on the Edge and Over: Searching for Art's Meaning in Contemporary Society 1970s-1990s. Hong Kong, 1996, p. 201, illustrated. Bijutsu Techno Monthly Art Magazine January 1995, p. 151, illustrated in color. The Sydney Morning Herald 12 December 1995, illustrated (work in progess). Beye, Prof. Dr. P., Dr. W. A. Lbeeren and J. E. Sorensen, eds. Jeff Koons. Exh. cat., Amsterdam, Netherlands: Stedelijk Museum, 1993 [Texts by Wim Beeren, Gudrun Inboden, and Peter Schjeldahl], inside back cover. Littlejohn, David. “Who is Jeff Koons and Why Are People Saying Such Terrible Things About Him?” Artnews April 1993, p. 94, illustrated. Sørensen, Jens Erik and Anders Kold, ed. Jeff Koons Retrospektiv. Exh. cat., Århus: Aarhus Kunstmuseum Denmark, 1993, p. 109. Jeff Koons. Exh. 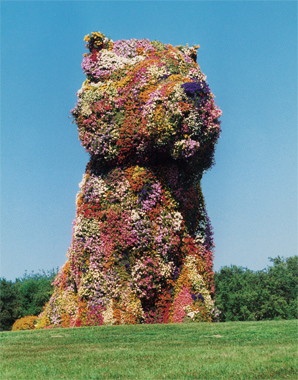 cat., San Francisco Museum of Modern Art; Minneapolis Walker Art Center, 1993, illustrated in color (installation view, Schloss Arolsen, Hess, Germany, 1992). Albig, Jorg-Uwe. "Jeff Koons, ein Prophet der inneren Leere." Art December 1992, p. 62, illustrated. Muthesius, Angelika, ed. Jeff Koons. Cologne 1992, pp. 162-63, illustrated in color. Smith, Roberta. 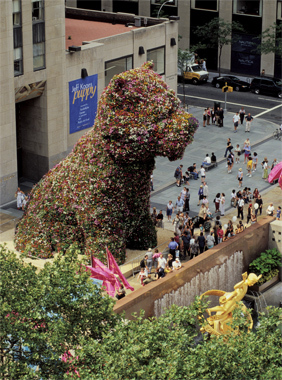 “ART VIEW; How Much Is That Doggy in the Courtyard?” The New York Times 5 July 1992.